SAN FRANCISCO, CA--(Marketwired - Apr 18, 2014) - Preact, the cloud-based, automatic customer success service, today officially announced the launch of the first service that helps subscription software companies maximize the lifetime value of their customers using leading-edge behavioral science, machine learning, and big-data analytics. The company also announced that it closed $4.6 million in Series A funding led by Trinity Ventures. Karan Mehandru, General Partner at Trinity Ventures, joined the Board of Directors. Prior investors Atlas Ventures, Karlin Ventures, Bee Partners, and Lion Wells Capital also participated. Funds will be used to grow the product team and expand sales and marketing efforts. Preact helps subscription software companies maximize customer lifetime value by reducing churn, acquiring more paying customers, and driving upsells. Preact automatically predicts and highlights the individual users and accounts that are likely to churn and/or upgrade. The company integrates its data into common workflow applications including Gmail, Marketo, Salesforce, Zendesk, Desk.com, and others. It currently works with more than 40 customers, including Adomic, Bitium, Doctorbase, EatClub, Education.com, Lettuce, Propertybase, and RJMetrics. "Today, it's far more profitable for software companies to keep customers than find new ones, which is why growing recurring revenues is the most cost-effective way to drive long-term value," said Michael Geller, CEO. "We're seeing rapidly accelerating demand from sales and customer success teams who need accurate analysis of the health and activity of their customers so they can act proactively to save or upsell them." "Preact is a critical part of the foundation underlying our Customer Success team; it's already made our entire team at least 25% more productive," said Robert J. Moore, CEO of RJMetrics, a Preact customer. "By quickly highlighting the precise customers in need of the most immediate attention, Preact is having a significantly positive effect on our retention and upsell rates." Gartner estimated that more than $250 billion will be spent on public cloud services in 2017, and Forrester estimated the U.S. eCommerce industry will be as large as $370 billion in 2017. 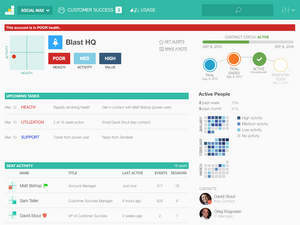 "Preact takes customer success analytics to an entirely new level. Instead of relying on static rules and guesswork, Preact uses proprietary data science to automatically measure the health of every user and account on a granular level," said Karan Mehandru, General Partner, Trinity Ventures. "This combination of extreme ease of use, advanced data science, and actionability enables businesses to keep tabs on their customers, reduce churn, and increase per-customer revenues. We're thrilled to partner with Preact by funding the next phase of their growth." "Trinity's expertise in helping SaaS companies execute will be invaluable to us throughout our next phase of growth," said Christopher Gooley, co-founder of Preact. "We are excited to work with Trinity Ventures as we bring modern analytics to customer success leaders." Preact also announced that Prakash Ramamurthy, Senior Vice President of Oracle's cloud management business, and Chuck Dietrich, former CEO of SlideRocket and GM at Salesforce.com, joined the Board of Directors. "Preact's use of deep, automatic data science is the next step in customer management," said Mr. Dietrich. "Preact tells customers how to ensure strong adoption, conversion, and engagement on a per-user basis. Every subscription software business will have to use Preact to ensure long-term success, and Preact has already become a critical foundation of a number of subscription software businesses, and they've only just begun." Preact is a cloud-based, automatic customer success service that helps subscription software companies maximize customer lifetime value by reducing churn, acquiring new customers, and driving upsells. Preact provides health metrics tailored to each user and account by tracking detailed session-level usage of web usage, mobile applications, and server activity. Preact predicts and informs which customers are likely to churn, renew, or upgrade by modeling usage and behavior patterns using big data analytics, leading-edge behavioral science, and machine learning. In addition, Preact provides deep, real-time visibility into product usage to dramatically improve customer support and product quality. Preact integrates its data into common workflow applications including Gmail, Marketo, Salesforce, Zendesk, Desk.com, and others. Founded in 2012, Preact is based in San Francisco and funded by Trinity Ventures and other leading venture capital firms. Learn more at www.preact.com. Trinity Ventures is a top tier venture capital firm combining business insight, practical expertise and a personal touch to help startups win big. For over eleven funds, Trinity has helped passionate entrepreneurs with breakthrough ideas transform markets and lives. Trinity's investment team takes a collaborative approach and believes in personal engagement, mutual respect and goal alignment to deliver outsized returns to entrepreneurs and investors. The firm invests in early stage technology companies with emphases on Cloud, Digital Media, Social Commerce and Entertainment, and Software as a Service. Learn more at www.trinityventures.com.